Description: Rhizome short-creeping, stipes covered with black scales. Fronds erect, clustered, all ± similar, pinnate to pinnatisect, usually 50–100 cm long, often pink when young, pale green and ± harsh when mature, segments usually alternate, not markedly reducing in size towards base. Sterile fronds with segments 10–15 cm long, 10–15 mm wide and minutely toothed, attached by broad bases; fertile fronds with segments 10–15 cm long, 5–10 mm wide. 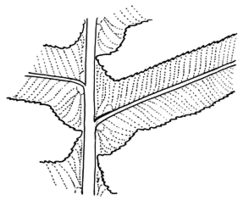 Distribution and occurrence: Widespread hardy fern found in open forest and rainforest. Other Australian states: Qld Vic. ?Tas.